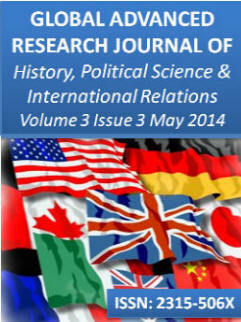 Aim and Scope: Global Advanced Research Journal of History, Political Science and International Relations (GARJHPSIR) ISSN:2315-506X is a multidisciplinary peer-reviewed journal with reputable academics and experts as members of its Editorial Board. GARJHPSIR is designed for the prompt publication of peer-reviewed articles in all areas of the subject. The journal articles will be accessed freely online. It covers all areas of history, political science, archaeology, international relation and related discipline. The Journal welcomes the submission of manuscripts that meets the general criteria of significance and scientific excellence. The journal invites original papers, review articles, technical reports and short communications containing new insight into any aspect of History, Political Science and International Relations that are not published or not being considered for publication elsewhere. Papers will be published after editors acceptance. All articles published in GARJHPSIR will be peer-reviewed. Our dedicated technical and editorial team members from different fields and related disciplines ensures the quality and review standard of our publications. GARJHPSIR is currently accepting manuscripts; you can support this journal; GARJHPSIR by sending your manuscripts to us or by joining our editorial team.